Shares of the beauty specialist dipped on a disappointing forecast in its third-quarter earnings report. 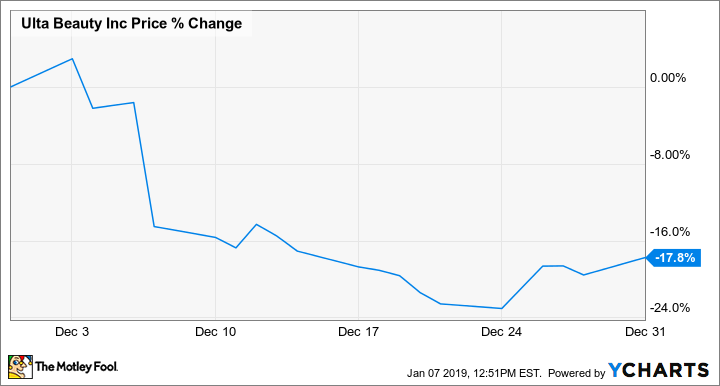 Shares of Ulta Beauty (NASDAQ:ULTA) slid last month, after the salon chain turned in a disappointing fourth-quarter outlook in its December earnings report and said it would open fewer stores than expected. Pressure from the broader market sell-off also weighed on the stock. As a result, Ulta shares finished December down 18%, according to data from S&P Global Market Intelligence. Ulta shares fell 13% on Dec. 7 after its third-quarter earnings report came out. The beauty specialist delivered another solid round of results, but its future outlook seemed to turn off investors. Comparable sales surged 7.8%, showing the brand continued to resonate with customers and remains a best-in-class retailer, and overall revenue increased 16.2% to $1.56 billion, as both in-store and e-commerce performance were strong. That growth drove earnings per share up 28.2% to $2.18 as the company benefited from a lower tax rate from the tax reform law. CEO Mary Dillon summed up the performance: "Ulta Beauty's strong performance in the third quarter reflects continued market share gains across all major categories, acceleration in our overall comp driven by healthy traffic, excellent new store productivity, and robust e-commerce growth." However, a modest outlook cooled off the stock: Guidance for revenue in the seasonally strong fourth quarter of between $2.09 billion and $2.1 billion was slightly lower than analysts had expected. Management also said it expected comparable sales of 7% to 8%, and earnings per share of between $3.50 and $3.55 -- up from an adjusted result of $2.89 a year ago but worse than the $3.62 analysts expected. Concerns about slowing store growth also weighed on the stock; the company said it would add 80 stores in 2019 and then 75 in 2020, down from about 100 new stores in 2018. With around 1,200 stores currently, Ulta has already penetrated much of the country, so it's being smart about expansion. Profit growth is also likely to slow next year, as Ulta laps the benefits of the new tax law -- so investors may be justified in lowering their expectations. Check out the latest Ulta Beauty earnings call transcript.